This is an uncommon 30.5mm. 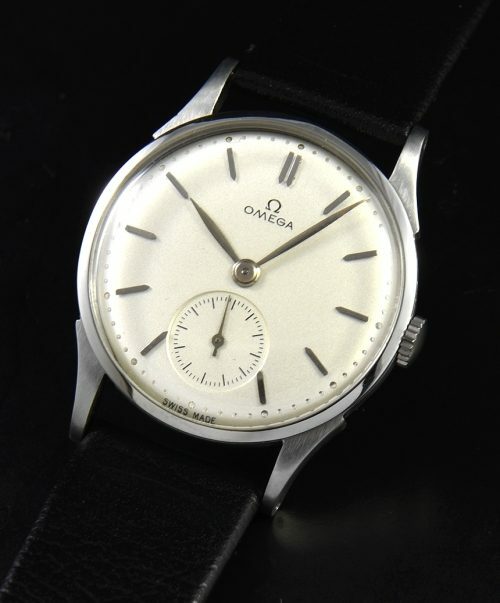 stainless steel OMEGA “Calatrava” style vintage watch. These smaller size watches are reminiscent to the Patek Philippe Calatrava watches of the same era. Even the dials (such as this amazing and completely original dial) and Dauphine steel hands are very similar to the Pateks during the 30’s and 40’s. The manual winding OMEGA movement was cleaned and is accurate. These are uncommon, subtle and fabulous looking vintage watches.